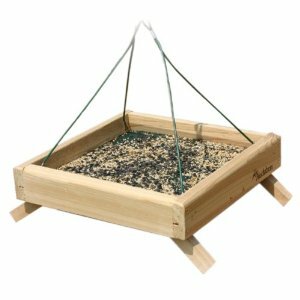 Choose a platform bird feeder for great bird watching. 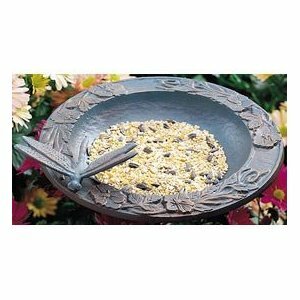 Not only are platform bird feeders the easiest type to use, but they also attract the widest variety of bird species. They are open trays that can be filled with seeds, nuts, scraps or other foods that all birds can access. Platform feeders, often called “fly-through” feeders, are any feeders that have an open, flat tray for holding a variety of foods. Platform feeders come in lots of styles, some with roofs, or removable screens for cleaning and drainage. They can be ground or hanging feeders, they can be extremely simple or very ornate. Bigger birds feel much more comfortable feeding on a stable platform than trying to squeeze themselves onto a precarious perch! And small birds are equally at home with the secure footing that a platform bird feeder provides. 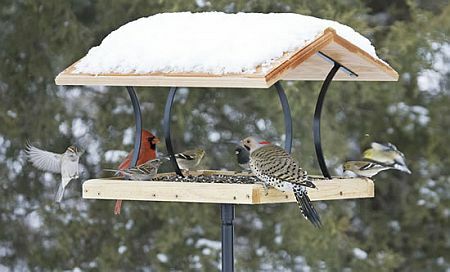 Make your own feeder from any unique materials, such as an old tray table, dry bird bath, wooden spool or a thick upright log. Be creative! Include a variety of foods to attract all sorts of wild birds. Offer any kinds of seeds, suet, fruits, such as apple or orange halves, stale bread, eggshells, mealworms and corn on the cob. You can also put out little cups of peanut butter for chickadees, woodpeckers, nuthatches and titmice, or cups of thinned grape jelly for orioles. There is a downside. Platforms do attract some birds and animals that you may prefer not to feed, such as starlings, pigeons, chipmunks and squirrels. If these visit your garden often, perhaps a platform feeder is not for you. But if they only make an occasional appearance, make peace with them and let these creatures have a share. Make sure your feeder has some kind of drainage holes to prevent water collecting in the tray. Audubon always makes a great bird feeder! This one is elegant to look at, sturdy, and a real magnet for all sorts of garden birds. It is handcrafted from durable cedar that will add rustic charm to your garden. The platform easily holds 3 pounds of food. The squirrels do come and enjoy any offerings. Not squirrel proof! You can hang, pole mount, or stand your feeder on collapsible legs. Be the envy of the neighborhood by attracting all kinds of birds with this Verdigris Dragonfly Garden Bird Feeder. The shallow bowl features cast flowers and leaves on the rim and whimsical drangonfly. Included is a 17' stake. Works well as a bird bath. Perfect to place on the ground or mount on a log or table top.